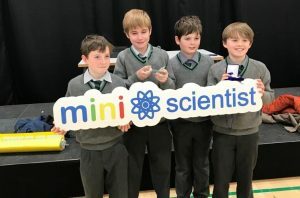 On Wednesday, we (Calum, Conor, George and I) went to the Intel Mini-Scientists Leinster Regional fair (held in Institute of Technology, Blanchardstown) after we were one of two groups selected to represent our school. Prizes were given to sixteen groups out of approx. 90 from all over Leinster. Our winning project was on the school towels’ hygiene. This idea was thought of at first as a joke by one of our members: Calum, when we realised it wasn’t a bad idea, this joke turned out for us qualifying in the Intel Mini Scientists National final 2019 in February…… We can’t wait!